Last Friday something really cool happened at the Montreal Children’s Hospital – Surgeons performed a MIPS – Minimally Invasive Ponto Surgery – on a 15-year old girl. She was the first person in North America to receive this surgery, in which they drilled her skull and anchored a hearing device to it. The surgery only lasted 10 minutes – you can read about it here. Shortly after, I started receiving messages from people who have heard the news. “Did you hear about the new kind of implant?” asked one, and “Can you get that instead of a cochlear implant?” asked another. There are different types of hearing devices, and each one is very different. What might be suitable for SpongeBob, may not be the best one for Patrick. Let’s learn more! Hearing aids are worn the ear or behind the ear. These small devices simply pick up sound with a microphone and amplify them. They are used by those who have a mild or moderate hearing loss. Kind of like what happens to your grandparents as they get older. They don’t correct hearing loss. Rather they just “aid” it by making the sound louder. Sounds travel through the ear in two ways – through air conduction, and through vibrations (bone conduction). When you talk, you mostly hear your own voice through bone conduction. Do you ever listen to a recording of your voice and go “Whoa, I do not sound like that! ?” That’s because when sound travels through your cranial bones, they are better conducted than when going through the air. So when you listen to a recording, the sound is getting to your ear through air conduction, which is at a higher frequency. For those who have problems in the outer or middle ear, sounds often get blocked and don’t reach the inner ear. A bone conduction implant uses the body’s natural ability to transfer sound and helps them bypass the damaged areas to reach the inner ear. 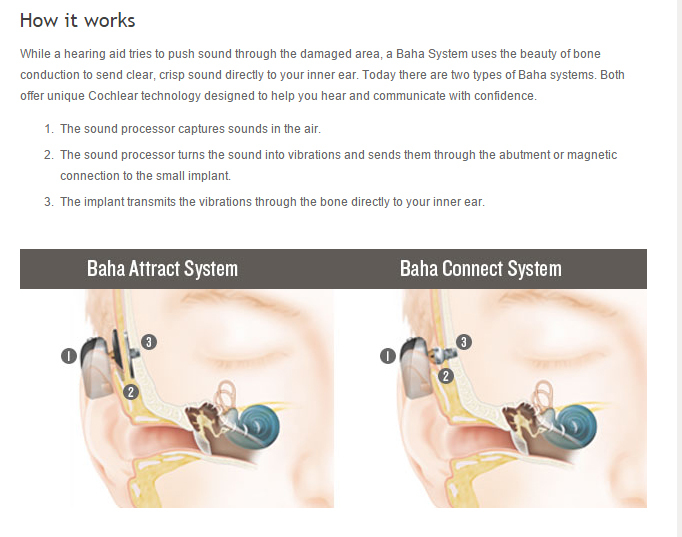 That being said, to get a BAHA, the inner ear must be fully functional. Since the story about the teen who got this last week got released, many seem to think that MIPS is a type of implant. MIPS stands for Minimally Invasive Ponto Surgery. The Ponto system is a type BAHA. Ponto is simply the name of the model. MIPS is the new surgical technique that was used on the girl. Previously, patients had to be put under general anesthesia, whereas with the MIPS, local anesthesia is sufficient. A cochlear implant is the type of surgery that I have been writing about all along. This type of surgery is needed when a person has severe sensorineural hearing loss. This type of hearing loss occurs when parts of the inner ear is damaged, namely the sensory cells and/or nerve fibers of the inner ear, inside the cochlea. 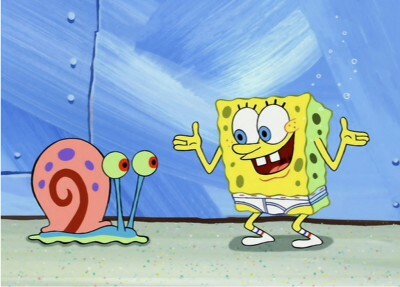 The cochlea is the little spiral thing that looks like Gary the Snail. Since it is impossible to fix these damaged parts, a cochlear implant is necesary as it involves inserting an electrode array into the cochlea. I described how a cochlear implant works in one of my previous posts – you can read it here. That’s all folks! Don’t tell the guys from Looney Tunes that SpongeBob stole their line. To be fair, hearing aids do a lot more than simply amplify sound, and can be used to aid more severe impairments as well. To associate them with the elderly as you do really doesn’t help eliminate the stigma of hearing aids that many younger users face. Hi! Yes, exactly. There is A LOT of information missing in my post. But it’s just to give people a quick “visual” in the few minutes they spend reading it. I lost my hearing at the age of 3, and the reason is unknown. Since then, whenever people asked me why, rather than saying “I don’t know,” I would answer “I don’t know, but it happens. Think about how older people lose it all the time. It can happen at any age.” More details however, will be going into future, more elborate posts.